While preparing SWUIS for its first flight on the Space Shuttle, Drs. Stern and Slater realized that the SWUIS system could be used to do a lot of useful astronomy from aircraft. 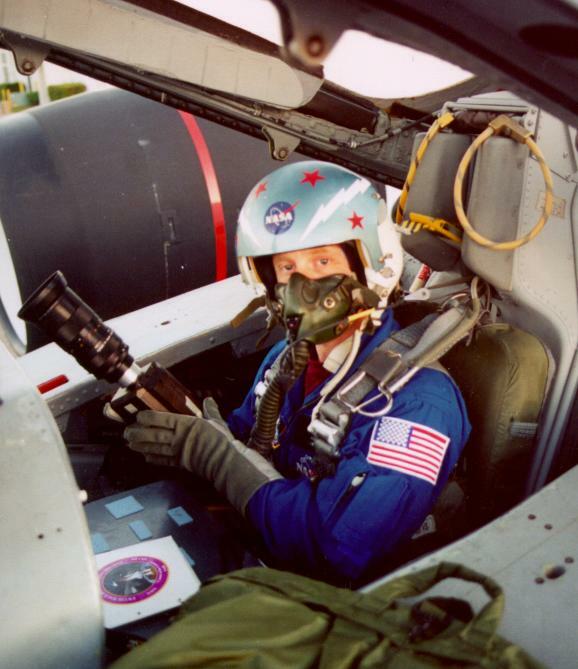 To demonstrate this, Stern contacted NASA Johnson Space Center's director, George Abbey, and requested authorization to fly SWUIS and its PI aboard a high-altitude remote sensing WB-57 aircraft during the STS-85 Shuttle flight. The WB-57 is an aircraft with many of the capabilities of the famous U-2 spy planes (see photo below). NASA maintains three in its inventory, two of which are based in Houston at Johnson Space Center's airfield, Ellington. These aircraft are used by NASA for a wide variety of research missions. The goal was to create an aircraft instrument much like the Shuttle SWUIS, and obtain infrared images of comet Hale-Bopp from the stratosphere while SWUIS was obtaining ultraviolet data overhead, from orbit. At the program's outset, they were told that NASA had never flown an outside researcher in this high performance aircraft. A two-seater, NASA WB-57 high-altitude research aircraft on the ramp at Ellington Field near Houston. The flight program was approved, and the team immediately swung into action. Whereas they had over a year to prepare for the STS-85 Shuttle mission, only a few weeks were available to prepare for the aircraft flights. During that time the project's aircraft integration lead, Bill Tomlinson, and project scientist, Dave Slater, put together the SWUIS-Aircraft (SWUIS-A) instrument in San Antonio, and then electrically interfaced it to the WB-57 out at NASA/Ellington Field in Houston. Meanwhile, PI Stern underwent a series of NASA flight physicals, and a WB-57 aircraft systems training course (as back seatter he would have, in addition to his SWUIS duties), flight crew responsibilities for certain subsystems. Stern also took altitude chamber training, ejection seat training, and later, a water survival course at Pensacola NAS in order to be flight certified for the WB-57. Stern also created and then validated a 16-page SWUIS aircraft operations checklist that planned every aspect of the aircraft work down to the tiniest detail. Once STS-85 was underway, the WB-57 research missions began. Four flights to altitudes as great as 55,000 ft were staged (photos). On the first flight the team conducted daytime systems tests of SWUIS-A to verify its operations and performance for the night time astronomy missions to come. Three night flights were then performed, providing dramatic demonstrations of SWUIS-A's capabilities for doing research from high altitude platforms. We are now leveraging the WB-57/Hale-Bopp flight experience into SWUIS-A projects using both Unmanned Aerial Vehicles (UAVs), as well as F-18 and other manned high-performance aircraft. Few institutions of any kind can now match the capabilities SwRI has for flying astronomical research missions in high performance aircraft. Planetary occultations are a well-proven technique for (i) measuring the radii of small bodies too small to be resolved in an angular sense, and (ii) obtaining pressure/temperature (P,T) profiles of planetary atmospheres. Planetary occultations have been routinely observed from groundbased sites for decades, and (in high priority cases) by the NASA/Kuiper Airborne Observatory (KAO) when it was operating. Unfortunately, many events are missed owing to either (a) the fact that they occur over water (which covers >70% of the Earth's surface), or (b) poor weather. We have developed the techniques for, and flight demonstrate the capability to observe scientifically valuable planetary and asteroidal occultation events from high performance NASA aircraft. This capability allows one to gather data from occultation events virtually anywhere, including over water, and with an essentially negligible probability of data loss owing to poor weather. By using small, high performance aircraft, occultation expeditions can be mounted at costs much lower than large-aircraft expeditions like the KAO (i.e., >$10K/hr); indeed, we expect to achieve mission costs quite similar to what is common for staging groundbased occultation expeditions using portable telescopes sent (with the observer) to remote sites. SWUIS-A consists of an image-intensified CCD camera with broadband response in the visible portion of the electromagnetic spectrum, high-quality foreoptics, an aircraft-to-camera power and telemetry box with camera controls (called the PIB), an LCD video monitor, and associated cable harnessing, optical filters, onboard video and voice recorder, GPS interface, and various minor equipment. The primary SWUIS-A foreoptic is a high-quality, fast, 85 mm zoom lens. The SWUIS-A ICCD frames at video rates, which is a key requirement for both jitter compensation and the high time resolution needed for occultation studies. SWUIS-A can also be used for other applications requiring wide-FOV airborne platforms, both downward- and upward-looking. Such applications might include orbital debris studies, Leonids meteor campaigns, aeronomy investigations, and studies of lightning and sprites/jets. SPIE paper on SWUIS-A (PDF version). Eos article on SWUIS-A (PDF version). F-18 Chase Aircraft images from NASA's Dryden Flight Research Center Photo Gallery. Click here to download the latest version (PDF) of the SWUIS-A flight ops checklist. See also our SWUIS Space Shuttle Missions page.